I pick up books randomly on occasion.Â Some end up being great, others are tolerable, and some are downright awful.Â I like to peruse the business, money, and personal development sections of the store for a good read that may enrich both myself and the readers here at Financial Methods. During a recent trip to the bookstore, my options were limited.Â Slim pickins’ to say the least.Â I leafed through a few books, but nothing really popped at me.Â It was either material I had already read, or books I just had little interest in. After three different trips to the money management/business section, I finally picked up a book that showed promise.Â I opened up to a random page, and scanned a few paragraphs. It just so happened that I flipped to a page that talks of The Lincoln Penny Scam.Â For those unfamiliar (I know I was), in the early to mid 1900’s, millions of ads were placed in numerous magazines and newspapers across the U.S. that promised “an original portrait” of Abraham Lincoln that was sure to increase in value over time.Â For a mere $100, the original portrait could be yours.Â Millions of people were drawn to this enticing offer, and bit.Â They were infuriated when they received a shiny new penny in the mail.Â This scam was finally put to rest in the late 1950’s. After reading about the Lincoln penny scam, I deemed To Pay or Not to Pay worthy of my attention.Â Unfortunately, I could have not been stupider.Â You have my word that from here on out, I will research my book purchases before I decide to plop down my hard earned money on products like this one….let me elaborate. To Pay or Not to Pay is nothing more than a clever name intended to sell copies.Â There is no useful information on how to get out of debt, unless you consider a lawsuit an “insider secret” to beating debt.Â Usually, I can get through a book on finance in less than a week, this one took me well over three.Â There were a few times that I was so awestruck by the content within, that I immediately had to read passages to Sarah just to get her reaction. 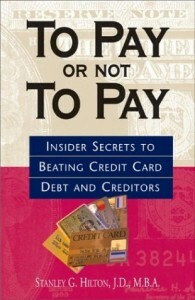 A more fitting name for this book would be: Get Out of Debt, by Suing Your Creditors.Â Honestly, if you want to know how to eliminate your debt, or get out for pennies on the dollar, sue!Â After all, these companies are all much too powerful and conscientious of their image to fight you in court for anything less than $20,000.Â The author argues that almost all companies will gladly forgo the expenses associated with a court case in exchange for a settlement that is far less than what you owe.Â If you are looking to take the dishonest and unethical way out of debt, this book is for you. There are many, many references to well-known philosophers, scientific minds and even The Bible that parallel the law.Â These references are scattered throughout the book and are all well thought, well written and make for a compelling case.Â While the case may be compelling, it is still unethical and immoral.Â There were a few occasions while reading that made me angry.Â Now, I am not usually the kind of person who would let emotions get the best of him, but when I read argument after argument painting all creditors as the bad guy, I get irritated.Â While I do not sympathize with creditors, I feel that most debtors are in a bad position because of their own poor money management. There is no chance I can recommend reading this book…to anyone…ever.Â There may be less than 1% of the population that is in debt that this book would be of use to.Â It is not for you, not for me, and (probably) not for anyone you know.Â This sue, sue, sue! mentality is dangerous and irresponsible to preach. Proper use of credit and understanding what companies demand of you when extending credit is essential.Â Poor advice like this only costs consumers more as a whole.Â If you believe and utilize the methods herein, you are only exacerbating the issue.Â The bottom line is, do not read this book. You will notice that this is the first book review that I have done at Financial Methods that does not contain links to Amazon that take you to a product screen of the aforementioned book.Â This is solely because I do not advocate the purchase of this book by anyone. Previous post: What Should I do if my Available Credit gets Lowered?